Dynamic loading of select lists in drupal can be easily done using Drupal form API. I had to implement dynamic select lists in several of my projects, I googled for some direct answer but did not find any. The answer was rather split among several sites or blogs. Hence, I am writing this blog so that you can find all the required code in one single place. I will create a form using form API where there will be two select lists. The value of the second(lets say it as child list) will be dependent on the selected value of first list(lets say it as parent list). The changing of the value of child list will be dynamic and done using AJAX. // Put your menu items here. // select list according to that. The above code will register a menu item where you can view the form. 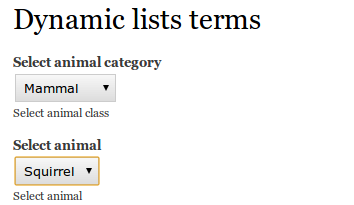 The form has two select lists, the parent list allows to select a class of animals, and the child list will dynamically show the animals that falls under that class. I am going to give another example, the following example is more manageable than the previous one. Instead of loading the values of select lists from array, we will load the values from taxonomy. Now we will load the parent taxonomy terms in the parent select list and their respective child terms in the child select list. // machine name of your vocabulary. // Load all the parent terms of the vocabulary. // The second parameter 0 means that we wish to generate the whole tree. // The third parameter 1 means that we wish to see only the parent terms. // Build the parent select list values. // Load all the child terms of the selected parent item. // The second parameter tells to load the tree based on the parent term ID. // Build the child select list values. // No value selected in parent selct list. See how much the code has shortened. 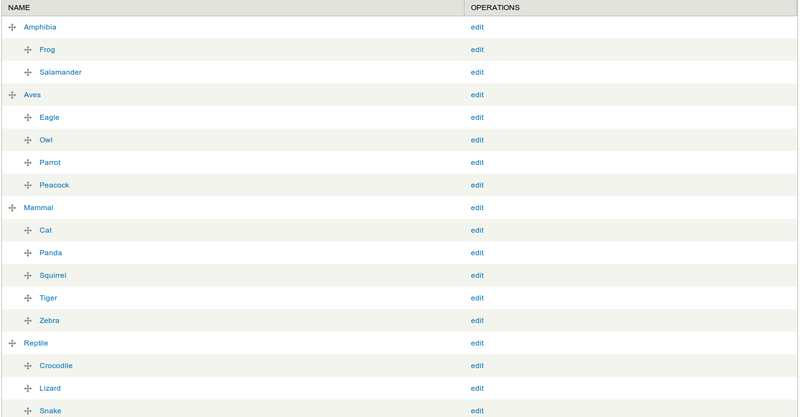 And also it is more manageable, you can easily add or remove parent and child terms in future. how to work with 3 4 level deep taxonomy terms ? and how do i save the taxonomy term references to the node ? Glad that I am able to help you. You just have to increase the number of select lists. Rest of the logic will be same. The select list options will be generated based on selection done in its parent level. And you can refer this blog http://timonweb.com/posts/how-to-programmatically-create-nodes-comments-and-taxonomies-in-drupal-7 for saving term references to node.